I was delighted to be one of the first students to attend Sol Latino after attending another language school for some time, and the difference was striking. My teachers were very competent after having enjoyed many years of teaching Spanish. (Many language schools there advertise that, but I found the reality to be quite different...) I attended classes with another North American, and we delighted in learning about the history and culture of Guatemala, as well as diverse activities such as hikes, a trip to a glass-making co-op, a trip to a water park, Guatemalan meals, and merengue and salsa classes and much more. Xela is a beautiful setting, and I have since returned there just to visit. (You will want to bring a coat!!!) I highly recommend Sol Latino for beginning learners as well as those who already know Spanish, but want to increase their competency in Spanish. Upon arrival in Guatemala I intended to study Spanish for only two weeks. It became four weeks, then five and finally it became six. I enjoyed the lessons and social activities so much that, each week, I decided to book an extra week of lessons. What attracted me to the Sol Latino teaching method is that there are a lot of possibilities for fitting your personal wishes in the learning program. Sol Latino holds regular evaluations, which safeguards the high quality of the lessons. Because of the intensive one-on-one lessons students get to know their teachers personally. Moreover, Sol Latino carefully selects the host families with which they cooperate. After the lessons, the school organizes a range of activities: I got Salsa lessons, visited villages surrounding Xela, climbed the volcano Chicabal and visited a glass factory. More than five months after I have left Guatemala, I am still in touch with my fellow students! Sol Latino gave me a marvellous time in Xela! I highly recommend the Escuela de Español “Sol Latino”. I studied previously at another popular school in Xela, and my Spanish was ok. Once I changed schools, I noticed a dramatic change in my Spanish grammar, comprehension, and pronunciation. The teachers were AMAZING! Gentle and encouraging, yet also tough and challenging to help me learn and grow more. The school treated me like family. Class time went by fast as we talked about many different topics. After class time, we had activities and trips and dances that were fun and informative. There were also opportunities to give back to the community and to charitable organizations in the area. The owners and teachers at the school are wonderful, kind, and goodhearted people who want students to learn and to have a positive experience. I remain close with my teachers who I count as life long friends. You will not be disappointed. I highly recommend Escuela de Español “Sol Latino” for personalized language study and a great Xela experience! Although I had little time, I gained so much from the atmosphere on campus and got to know the culture in the area. The curriculum the school offers is developed for each student individually as there are a variety of teaching methods and the teachers are in touch with the pace of each student. I was happy to study the language not just through books, but through games, internet, trips, different activities, and of course the lovely family that hosted me. The breaks and activities are well planned, allow you to concentrate on your studies and enjoy them. In one week, I was able to learn all the main verbs, vocabulary and grammar. I got to know different issues in the Guatemalan society and to acquire the basic things I needed to get along in the Latino environment. Looking back I realize how much I have gained from this experience. I gained more confidence and I had an amazing time. I still keep in touch with the warm, bright, kind and experienced teachers of the school. I recommend it highly for everyone! When I arrived in Xela, two teachers from Sol Latino picked me up from the bus station. They brought me to my host family in zone 1 of the city. This is the centre of town. I lived close to all the important spots like places to go out, the Spanish school, ‘parque central’ and the bus to go to the project where I volunteered. It was a nice family, the parents were young, between 35 and 40 and they had two children, a 5-year-old son and a 13-year-old daughter. There were also Guatemalan students living with this family too. I think it was a modern family; they had their own ‘tienda’ next to their house. The both took care of the household, the store, the students, the food and the children. ‘Mom and Dad’ were good cooks, so I did not have to complain about the food (I’m a vegetarian). I also made a small trip with them to Lago Atitlan, we went to see some huge fireworks, a good movie, and they brought me to a good dentist. It was a good way to get to know the culture. The plan was to live with them for 4 weeks, however, this changed and I stayed there for 4 months! After 4 months, I moved to an apartment, where I lived for 5 more months, but I kept on visiting my host family. If you have any questions about the Spanish school Sol Latino, the volunteer project Caras Alegres, living with a host family, or about the nicest town in Guatemala: Xela, you are free to email me or look at my web log www.esmeraldasmit.waarbenjij.nu (it is in Dutch and English). Thank you. You have taught me to speak Spanish. In a short time was able to read, write, and speak Spanish with your help. I especially liked the flexible hours and all of your answers to my numerous questions. Thanks again, and if you would ever need a reference I would be more than happy to provide information to students looking for a great school to learn Spanish. When I arrived in Guatemala I just knew 4 words: “si, no, buenas noches and amigo”. That was it. Not enough to help myself out. From the moment I entered the school, that changed. It is not that you get to speak Spanish, you need to, because they don’t speak English. I enjoyed the private classes, accommodated to your own Spanish level. There is enough variety, so they change grammar by going to the market and playing a game. This way you don’t just practice your Spanish in the classroom! The school is very flexible and they are open for suggestions. Also they find you a good host family. So you can rely on the school. I entered with 4 words, after 2 days I had a Spanish conversation! In 2005 I had the pleasure of studying Spanish one-on-one with Irwin Rosal (the founder of Sol Latino). He was an excellent teacher who worked well with my specific needs to help me advance my Spanish proficiency. So when I returned to Guatemala I was excited to hear that he decided to start his own Spanish School and I also gladly accepted the role as being the schools first International Coordinator. I served as the Coordinator from January to April and besides the normal job duties (translating conferences, scheduling and leading activities, and answering questions from current and prospective students) I also had the extra responsibilities of working on building the website, creating promotional materials and even helping move into the building. So I was very busy those first months of my holiday, but it was all worth it since I believed in the teaching ability of the staff and the philosophy of the school to provide a high quality education and improve the lives of many Guatemalans. My name is Jacobine and I am living in The Netherlands. Between February and April 2008, I lived and worked Quetzaltenango (Xela) in Guatemala for a charity project run by our school. I got excited about this opportunity to help others during various presentations on this subject while I was finishing my studies at the school. After a long journey I started my work in Xela with a thorough Spanish language course at language school Sol Latino. The language course took almost a month and it gave me the opportunity to communicate with people living in the local communities. After that first month, I started doing volunteer work at a small local school with 50 students. The school is located on the top of a mountain in the village San Jose Chicilaja. Every day I travelled by bus from my host family to San Jose Chicilaja, followed by a walk up to the mountain top. I was working with the youngest children, between the ages of four to eight. The daily activities I was involved in were singing, teaching writing, playing games, making puzzles and outdoor activities including gymnastics. The children seemed to like it and so did I! And the language course during the first month made this all possible! The children only have lessons during part of the day. One reason for that are the relatively long traveling distances for the kids. The other reason is that children often also need to work at home or on the street in order to earn some money for the family. In this manner, it has been very fulfilling for me to help these kids build a better future by educating them. I hope I have been able to make a little contribution to that better outlook for their futures! 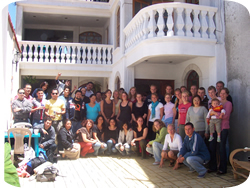 In 2007 I atended Escuela de Español "Sol Latino" in Quetzaltenango. Every day I had 5 hours of Spanish, which was demanding and educational, but also a lot of fun. I stayed with a host family. This was the best experience ever! It's the best way to get to know a country's habits, way of life and get a clear picture of the daily activities and worries because you are actually part of it! I was forced to speak Spanish, being a member of the family, so it’s free practice,. The family took care of me and looked after me as if I was a relative. This warmth of the people made me feel at home, in fact made me feel a Guatemalan. In 2007 and 2008 I took a lot of classes at Sol Latino. What I really liked about Sol Latino is their flexibility and personal approach. They take the wishes of the students seriously and take care of a comfortable arrival and stay in Xela by offering a good pick-up service at the airport and by organizing lots of weekly activities so you’ll get to know the surroundings of Xela and your fellow students quickly. You want to learn Spanish in Xela? I recommend you study at Sol Latino! My experience in Guatemala with the language school and my host family was very good. The moment that I arrived the school and the host family immediately took care of me. I became a part of the family. Also the language school has a good ambiance and social scene, and I felt as if I was at home. My classes were good and intensive. There were also nice activities besides the classes. I experienced a lot there and enjoyed all of it! The teachers at Sol Latino are very nice and have much experience in teaching Spanish. In my experience with learning Spanish, my time at Sol Latino helped me the most. I have great confidence in myself when I speak Spanish and I understand most conversations in Spanish. When I studied at Sol Latino, I stayed with a local family in Xela. The rooms were very clean and the food was always delicious. All host families live near the school so you can walk to school. In zone 1, where the school is located, are restaurants, shops and a market. Everything you need is there, it is also a safe zone. If you want to be absorbed in a totally different culture and in an environment where you can improve your Spanish, then Sol Latino and Xela are the best places in Guatemala! I had a wonderful time at Sol Latino. This Spanish School doesn’t just improve your Spanish, but also organizes a lot of activities for its students. These activities give you more knowledge about Guatemala, its people, culture and costumes, and are always a lot of fun! Sol Latino offers dance classes, sports, excursions, dinners and trips to the beach (between the classes you have to maintain your tanning of course). The instructors are very kind and helpful. I had a great time at Sol Latino! It’s now been 1 year since I went to Guatemala to learn Spanish and to do volunteer work. I began at a Spanish school that had some connections with the project I wanted to work at. They arranged a hotel for my arrival in the capital, and they found a family in Xela where I stayed for 6 weeks. I learned Spanish for 6 weeks and every week I had a different teacher. The school is in the old centre of Xela, near a typical Guatemala market, a great spot. The program is quite intense, but very nice. There are a lot of different ways to learn Spanish. The school is also socially involved, and in addition to many opportunities to go on excursions you can attend lectures on topics such as human rights or Maya rituals. The Morales family, where I stayed for 6 weeks, gave me the opportunity to experience the Guatemala way of living. I have very dear memories, leaving after 6 weeks was not easy. At the end Rineke, the International Coordinator at Sol Latino, helped me find a different place where I could stay and work for my last 2 weeks in Chimaltenango, Guatemala. Señora Morales and Sol Latino made my stay in Guate an unforgettable time in my life! Hola! Thanks for 5 exciting and adventurous weeks in Xela! There's definitely no better way of getting to know Guatemala and learning Spanish additionally! I will come back! I had Spanish classes at Sol Latino for 1 month, the easy way: every day for 4 hours. I had already studied Spanish before, and I liked it so much that I was able to do this. Every week they change teachers, which is very informative and offers good variety. Sol Latino also found me a host family, it was so fabulous that they arrange everything! With the family you speak Spanish, but sometimes also English and Dutch. After Spanish classes we did a lot of fun things for the activities. For example making “chiles rellenos”, filled paprikas with ground meat and vegetables. Also we had a movie night and once we went to a conference on “the situation of the women in Guatemala”. Sol Latino was a very nice and informative school, where the staff is flexible and kind! I took 3 weeks of classes at Sol Latino. One week I received my classes outside, enjoying the sun, and the other week I studied inside the school in a classroom. Both have their pros. The Spanish classes are nice and informative using a study program with study goals for the week. So there is nothing to worry about as a student, because the teacher takes care of the study program. Always there is time for a nice conversation, for example about the salsa classes the night before. The teachers are very dedicated and always in the mood to teach you Spanish. But they also enjoy going to the market on a sunny morning to buy some fruit or vegetables (where at the same time learn the names for them!). Sol Latino is a pleasant language school with dedicated teachers and a relaxing atmosphere. I enjoyed my room in the guesthouse Casa Latina, most of all because of the big, modern bathroom and the well equipped kitchen. This was a lot better than the badly equipped spaces in other places.